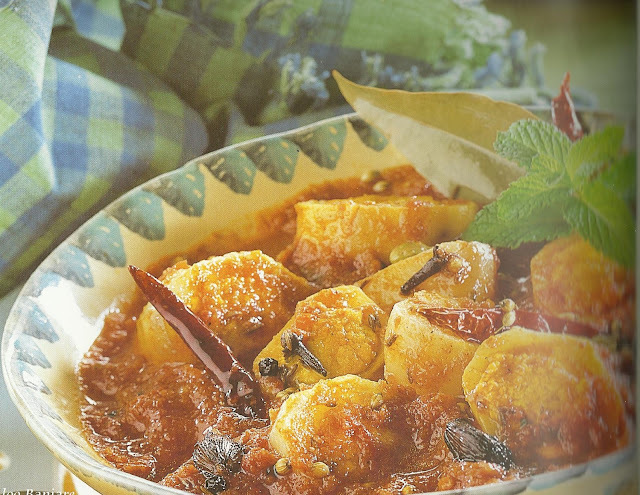 Aloo Banjaare- Hope you enjoy! 1. In a microwave safe bowl place oil and whole masalas and microwave for 2 mins. at 100 % power. 2. Add onion, ginger, garlic, green chillies paste and microwave for 5 mins. at 100% power. 3. Add tomato puree, kasuri methi, salt, degi mirch, chopped ginger, coriander, green chilli and microwave for 4 mins. at 100% power to make a thick gravy. 4. Scoop semi- cooked potatoes and grease them. Place in pre- heated dual roast for 10-12 mins. for roasting. 5. Mix crushed paneer, turmeric powder, salt and mirch. 6. Fill in scooped and roasted potatoes. Add in gravy. 7. Microwave for 2 mins. at 100% power. 8. Garnish with kasuri methi, julienne ginger, green chillies and coriander.